The husband is half Brazilian and has taken me to Brazil a few times to meet his family, experience the culture and enjoy the beaches and coconuts in Rio de Janeiro. Turns out i’m a bit obsessed with fresh coconut water. 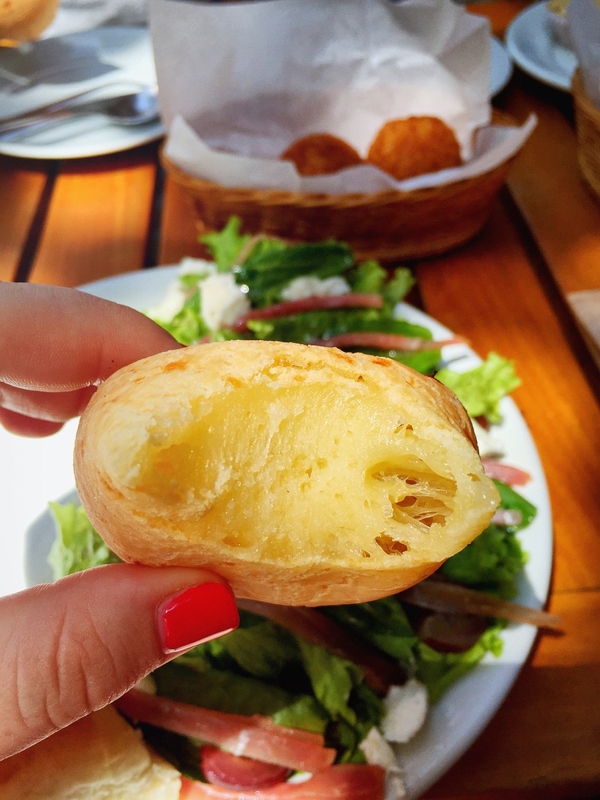 His family is from the state of Minas Gerais and that is where Pão de Queijo is said to have originated from. I learnt to make this insanely addictive cheesy, chewy ball of goodness from his father. It was a complicated process. The recipe being in his head and hands. How much cheese do I add? Oh just a handful or so. And how much oil? Meh- just a splash and a bit. Until it’s the right consistency he would say. 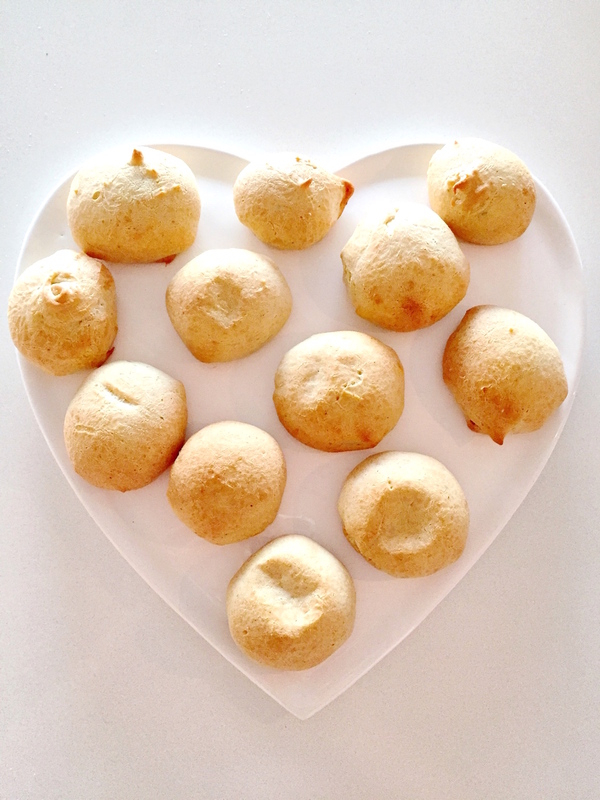 So once we finally got a recipe going I started practising my Pão de Queijo skills. Turns out they are super easy to make which is a good and bad thing. Good because they’re totally delicious and I score big time with the husband for making them. Bad because now I want to make them ALL THE TIME. They’re gluten free which is a bonus. They’re made using Tapioca flour, aka cassava flour, aka manioc starch aka aka… you get the picture. There are a lot of names for this one versatile vegetable and it’s various forms. Read up about Cassava here. 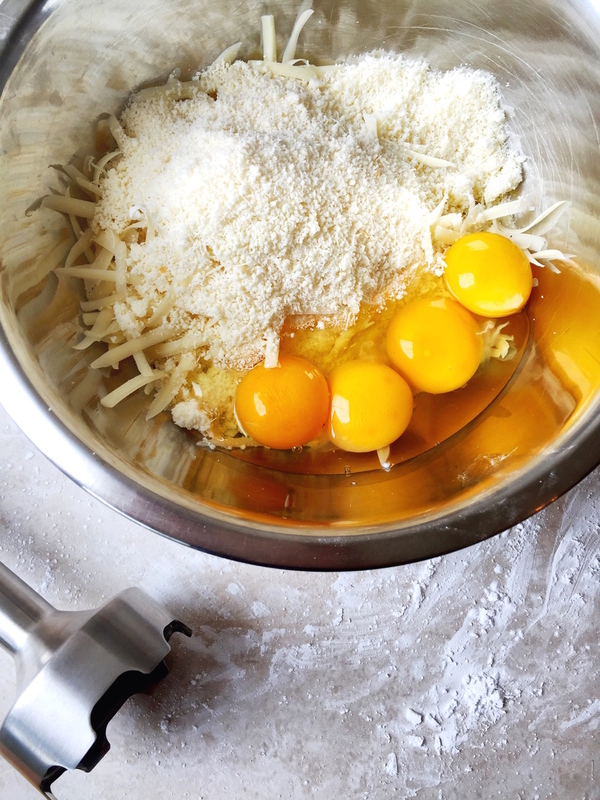 Using a stick blender, puree the parmesan, eggs and egg yolks together. This will form a slightly odd looking cheese paste. Don’t fret. This step incorporates the cheese in magically. Place tapioca flour and salt in the bowl of an electric stand mixer fitted with a paddle attachment. 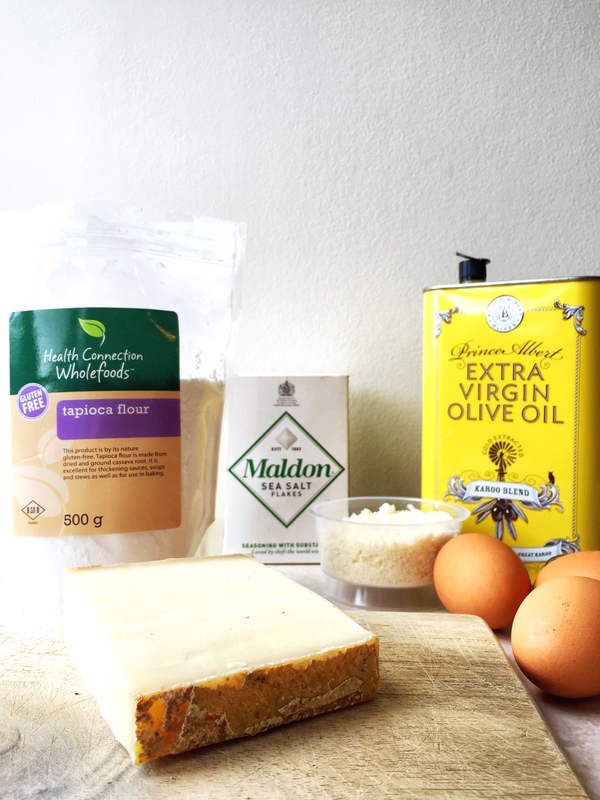 Place the milk, olive oil and water into a sauce pan and bring to a boil. Start your stand mixer on the slowest speed. As soon as the mixture comes to the boil, pour into your dry ingredients and continue to mix on low speed until everything is well incorporated. Add your cheese paste and spices to the mixer. The spices are not traditional but I think they add some really great flavour. Continue to mix the dough on low speed for about 10 minutes. The dough will lighten in colour and will be incredibly elastic and sticky. Scrape into a bowl, cover with cling film and leave to rest in the fridge for an hour or even overnight. Pre-heat the oven to 200˚C. Lightly grease a baking sheet with some olive oil. Grease your hands well with the olive oil to prevent sticking and begin rolling out ping pong sized balls of dough. Bake your cheese bread until golden brown- about 15 minutes. It’s a very gentle golden brown. Do not over bake them. It’s a crime. They must be gloriously chewy inside. If you can wait long enough remove them from the baking tray and leave to cool ever so slightly. You want to serve them warm. But realistically I wolf them down straight out of the oven. Burn my tongue and do it all over again. My sister in law has Celiac Disease and very cleverly makes delicious little sandwiches with the cheese bread. So enjoy them as they are or once cool slice them open and stuff with even more cheese, ham or whatever floats your tastebud boat. And here’s a snap of the real deal from our last trip to Rio. Seriously. It does not get better than this. This pão de queijo was from a little deli near our Airbnb. Every single morning we would walk there for breakfast and proceed to the beach for coconuts and caipirinhas. Tough life. These are one of my biggest treats! When you say “Full cream milk” do you mean Whole Milk or do you mean Heavy Cream? I’m from the US so I wanted to clarify, since we don’t have anything here called full cream milk. Thank you so much for posting this recipe! Whole milk is correct! I so often wish we just had some universal measurements and names for things! And don’t get me started on plugs in different countries! haha Happy baking! What are these like with bread four? I can’t get tapioca flour in the shops in the UK, not even the health food shops have it (I’ve tried), and it’s really expensive online. Hi Colin! If you’re in London- There’s a shop in Golborne Road, just off the Portobello Road called the Lisboa Delicatessen where you can buy it apparently. Also have a squiz again online. Amazon- 3£ for 1kg or bulk 2.5kg for 7.30£. You really do need this specific flour to make these or you lose the stretchy gooey chewable texture of the cheese bread 🙂 Hope you find some!